An inspection of #Mablethorpe on the #Lincolnshire coast of #England – The Diesel-Electric Elephant Company. This is the season when the English sea-side closes, bars its doors and windows and retreats down some deep, dark hole to hibernate until about March. Yesterday the old Bugatti had a tail-light out and didn’t respond in any meaningful way to my changing the bulb, so I had to take it to the professionals. The nearest authorised dealership is in Mablethorpe, a sleepy little sea-side town about seven miles away from Hutson Towers. The garage was open, Mablethorpe was closed. At least the queue was short. There’s no escaping the process, so one simply hands over the keys as though phtttt, it’s just a lump of metal, mate, and strides towards the horizon as though shambling up and down the streets of a deserted English sea-side town was top of your to-do list that day, and you can think of nothing nicer. Seriously, if we all spoke the truth the mechanic would just say ‘look, either sit in the corner out of the way, or sod off and let us get on with the job’, for that is what he means. The home of the See Food Diet, when open for business. Anchors away, eh? 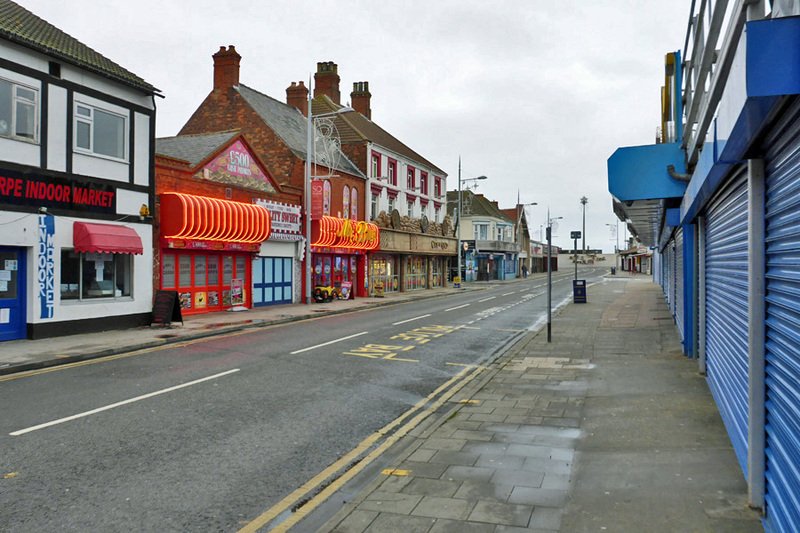 Mablethorpe dates from the fourteenth century, although a large part of it suicided during the 1540s or, as the more sensitive media of the day put it, ‘was lost to the sea’. The town has had an RNLI lifeboat station since 1883, and currently sports a ‘Class D’ lifeboat, the D-653 William Hadley. The town got awfully wet indeed during the 1953 North Sea Flood, a flood that killed some 2,551 persons in the Netherlands, England, Belgium, Scotland and “at sea”. It also killed some 30,000 animals, damaged 47,000 buildings and destroyed some further 10,000 (but not all in Mablethorpe). The town was visited regularly by Alfred, Lord Tennyson, and was mentioned in D H Lawrence’s novel ‘Sons and Lovers’ as a holiday destination. Who knew that after such an august history, it would then be treated to a royal walk-about by me, eh? 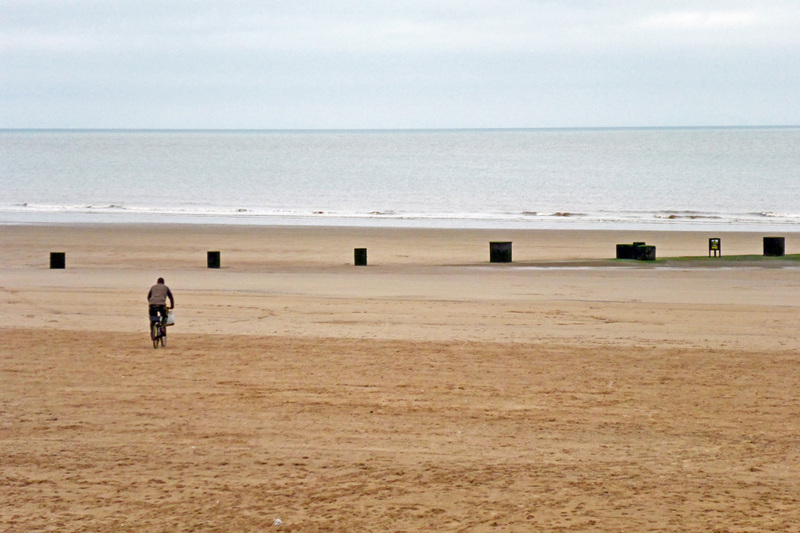 A man driven insane by the isolation, riding his bicycle at speed into the sea. 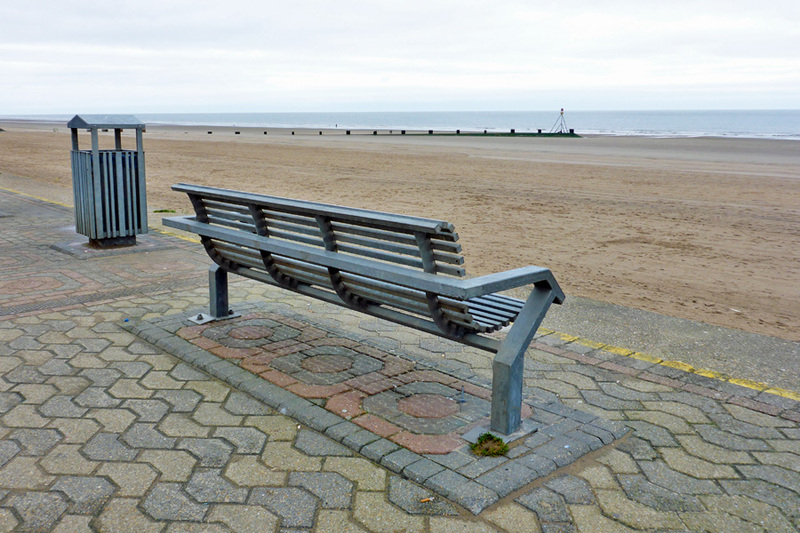 I am familiar with Cleethorpes in all seasons, and I have been horribly familiar with Blackpool in all weathers, having slept in its telephone kiosks (drunk) and slept on its pavements (drunk) and rolled out of its nightclubs (drunk) on many an occasion thankfully not reported by the mainstream press. Mablethorpe is no different. In fact, in winter, it’s absolutely identical – empty, sand-blown streets, a few die-hard novelty shops still opening their doors, the aroma of fresh potatoes wafting from the rear yards of a dozen fish and chip shops, signs indicating public lavatories and various attractions rattling in the wind. 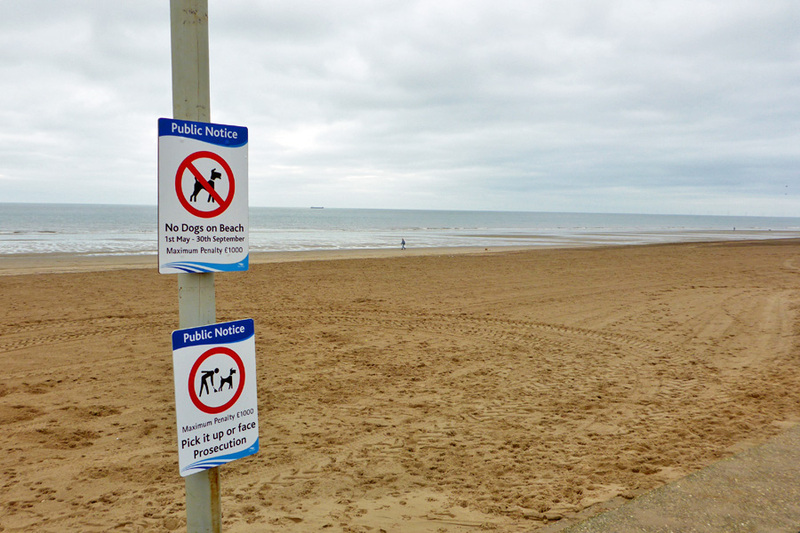 Dogs are not allowed on the beach during the months of May, June, July, August and September upon penatly of £1,000, although I do wonder how many dogs would be able to pay such a Draconian fine without some assistance from their humans. The beach itself is extensive, and unlike that of Brighton (somewhere else that I’ve also slept al fresco and puked on a lot), is of proper sand and not rocks. It extends left and right as far as the eye can see, naturally, (seal sanctuary and gas pipeline to the north, wind-farm to the south) and as far out to sea as the North Sea allows, which is a variable amount dependant upon tides and the EU budget for salt water. The North Sea is a precious commodity, every bit as precious as the English Channel, separating us as they do from “rotten foreigners” and “the abroad”. It should be noted that in times of fog the continent may be cut off entirely from civilisation, but they all “le bumble” and “das manage” nicely anyway, being barbarians and knowing no better. 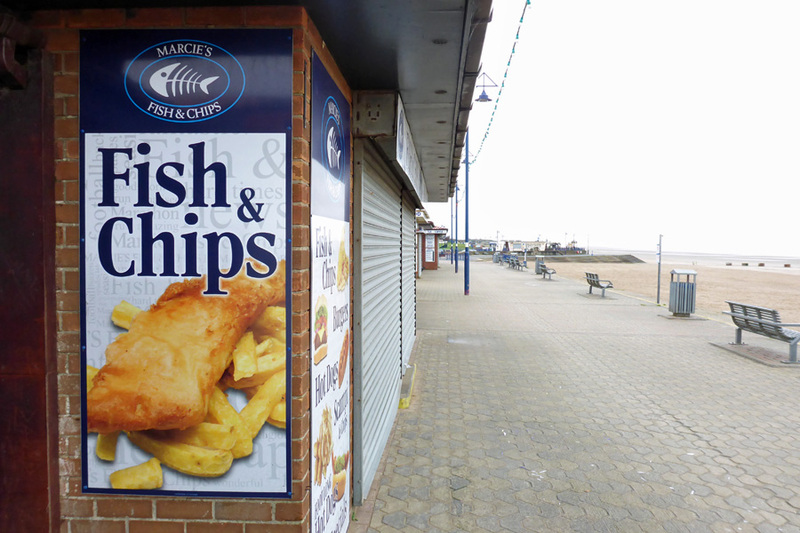 Fish and chips; an empire was both built upon it and lost. The government men tell us that an anglicised version of an Indian curry is the “National Dish”, but we the non-politically corrected people know better; it is Fish & Chips. Mablethorpe exists now almost entirely on grockles and is surrounded by eleventy-twelve million static caravans that are supplemented during high season by thirteenthy-two billion of the more mobile variety of caravan. 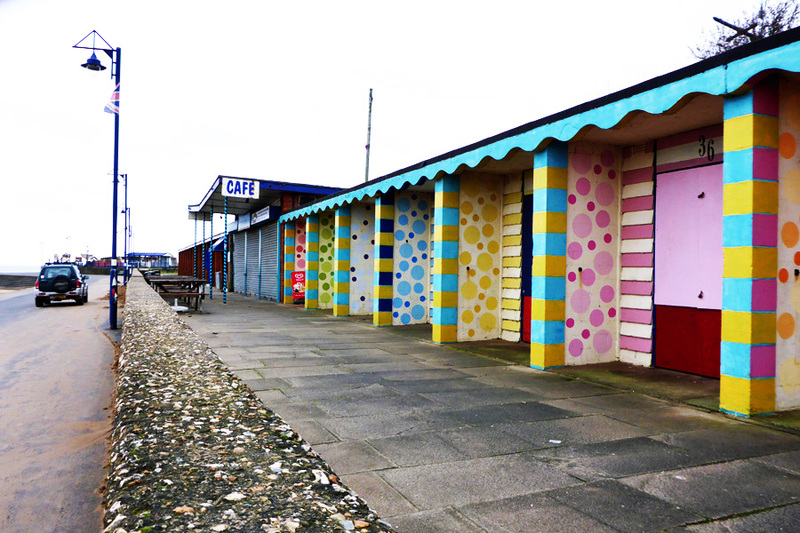 Mablethorpe hosts Britain’s only beach hut festival, Bathing Beauties, in September each year. Owners of private beach huts compete in exterior design, amidst a backdrop of poetry, music, and drama. A quick rub down with a Boy Scout, some No.3 sandpaper and a few tins of B&Q’s finest weatherproof gloss wouldn’t go amiss, here and there. Here, certainly. Apparently, there is also a Mablethorpe Marathon race that attracts some 2,500 runners each year, but I rather think it more likely to be merely an unusually well-organised attempt to run out of town and away over the hills, than any recognised form of sport. The runners are all usually re-captured quite swiftly. The town does sport winter illuminations, and celebrities that have attended the switch-on event in the past include Barbara Windsor, Timmy Mallett and Wolf and Hunter of Gladiators… Being daytime and too early in the season, these were not a-glow during my visit. Oh some folk they do like to be beside the sea-side, they do like to be beside the sea – in gaily, if not subtly, painted Council beach-huts, but not me. I. Not I. That is to say that I don’t, not for long, anyway. Lush green, wooded countryside of the English variety remains my natural habitat but don’t misunderstand me, I love English seaside towns too – during winter (only), when they are deserted ghost towns such as this. During summer they are indescribable hell-holes and to be avoided at all costs, but during winter they settle into a unique, almost post-apocalyptic charm all of their own, and are apparently populated entirely by half a dozen dog-walkers. 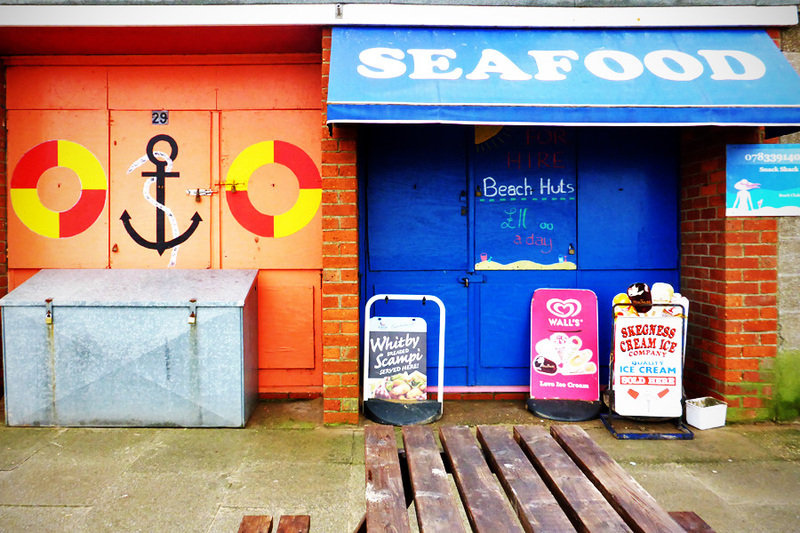 Mablethorpe in winter, like all of the others, just needs a good hug (and fifty quid’s worth of gloss paint slapping around). 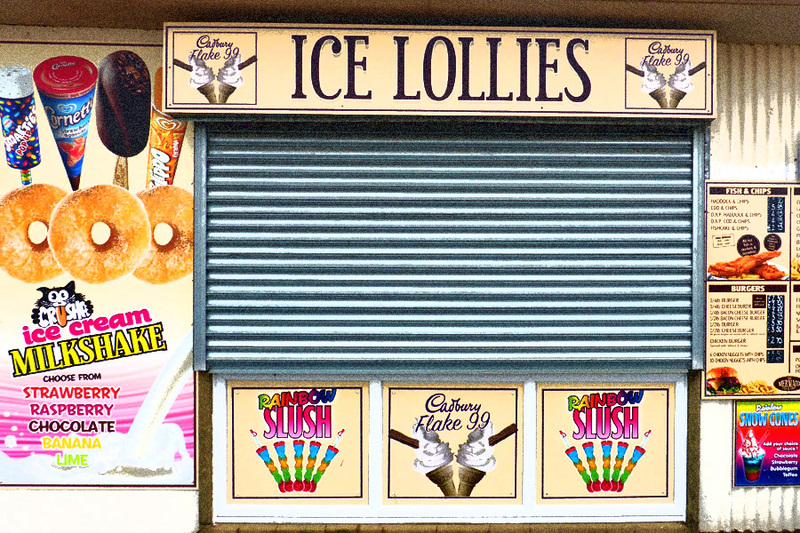 In winter the parking restrictions are eased, the tiny multi-screen cinema beckons with row upon row of empty and available seats and there’s very little danger of being killed by a tsunami-like invasion of candyfloss rolling up the High Street like demented tumbleweed. ‘Mon Favela’ since one ‘Dun Roamin’? 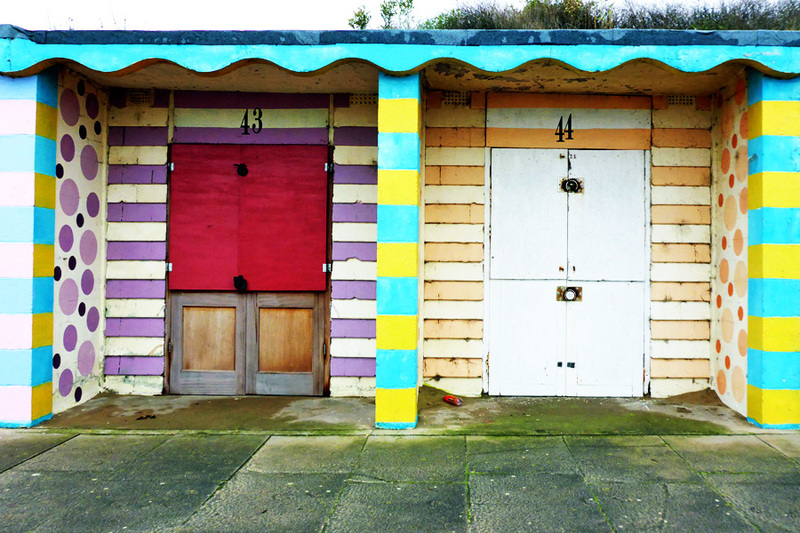 The “beach huts”, in all of their variants, remind me of nothing so much as prime examples replanted from some Brazillian slum or shanty-town. In summer the inhabitants doubtless follow much the same occupations (drugs, violence and indiscriminate breeding). There is a “camera obscura” on the promenade, the better to be able to watch the huge vessels driftying by – probably en route to or from the River Humber – carrying cars, oil and, these days no doubt, Syrian refugees in their holds. 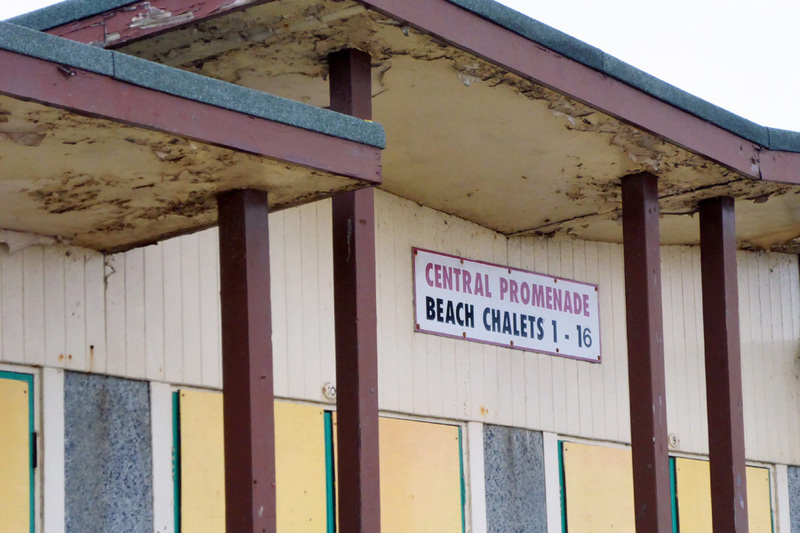 What to do in a closed sea-side town while waiting for a mechanical pronouncement? Take a few photographs, of course. All in all, the time actually passed very quickly, and my initial desperate need for micturition was forgotten (proving that it is more of a psychosomatic than a plumbing need). What to do? Why, choose bench, of course, and gaze out towards “Abroad”. This one was ideally suited. The problem with the Bugatti? Apparently a dodgy connection in the wiring that, once identified, was then kindly remade by a small solderer’s large apprentice and all was then well, with a price tag of a mere pony for the whole job (‘scuse the Cocker-knee slang for twenty-five knicker, or approximately £25, whatever that is in guineas). 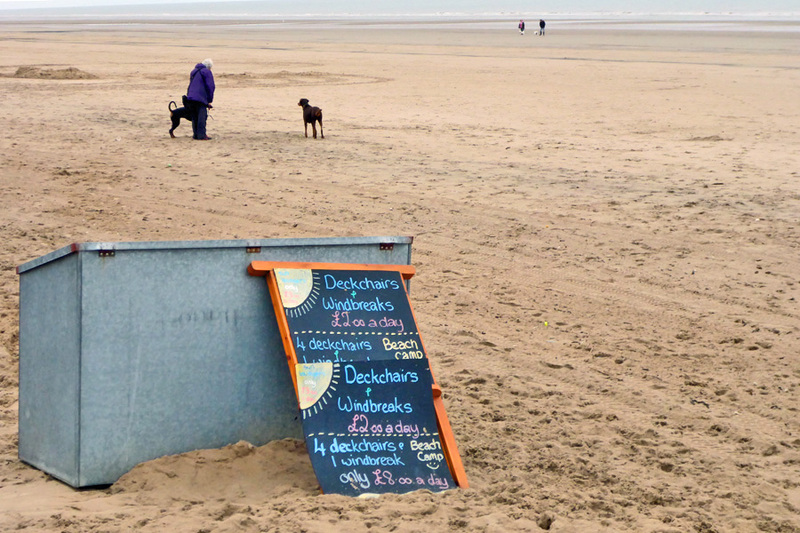 Do dogs need windbreaks? I suppose that it depends upon their diet. 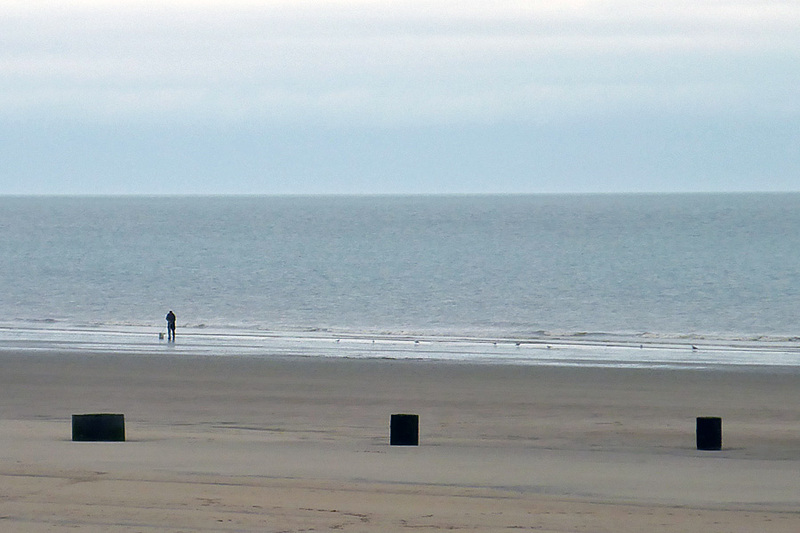 Man and dog looking at the sea, with seagulls approaching. Next Kissing goodbye to ninety-nine tenths of my worldly goods – eek! It is a shame that your repair could not have been carried out in Scarborough, where I was last weekend, since not only was everything open but it seemed to be a thriving town with a lovely beach and the sum shone too! And possibly Simon and Garfunkel? When I lived in Stamford (Lincs) years ago, I took the family to Mablethorpe via Louth (Lincs) where I got a puncture and had to call into a nearby garage there to have it repaired (so I still had a spare tyre for emergencies). Needless to say I have never been back to either since! 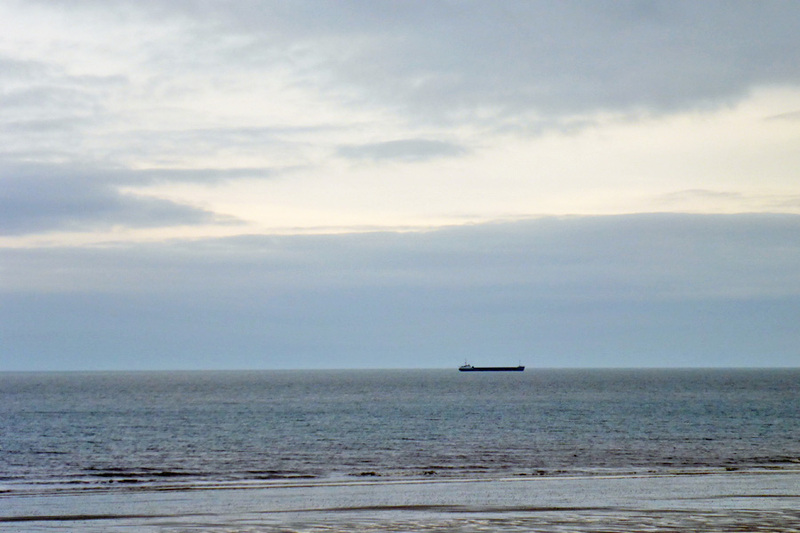 BTW, are the North Sea oil rigs still visible from the beach? Reggie Perrin on a bike! Whatever next? Reggie there was a little bit nervous, swerving at the surf several times before choosing his point of entry. I like to think of him now as being not so much dead and buried at sea but in Holland, opening his chain of Grot Shops. Grotte Showpe, widt grotte for buyen.